Pacific Women’s third progress report was launched by the Australian High Commissioner to Fiji, Her Excellency Margaret Twomey, on 20 November 2017. 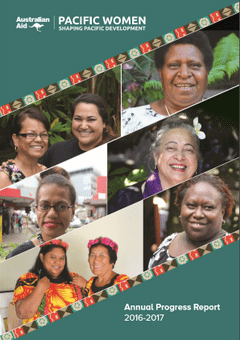 The Annual Progress Report, covering the period 2016 to 2017, features case studies that highlight the voices of Pacific women and men and the key achievements across the 14 countries supported by Pacific Women in the core outcome areas of: leadership and decision-making, economic empowerment, ending violence against women and enhancing women’s voice and agency. Read in full here. An interactive copy of the latest report can also be accessed here.